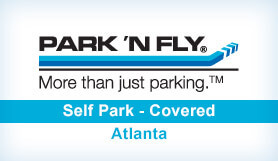 Park ‘N Fly deliver affordable and secure parking for all domestic travellers flying from Atlanta Airport. With their covered self-serve parking option, you’ll be able to pick your perfect space and take your keys with you – safe with the knowledge that your vehicle is protected from the elements. Park ‘N Fly also have an incredible customer service package that includes special text-based pickup and premium luggage assistance. You can even book a few extra packages, like Jiffy Lube servicing, deluxe hand car wash, and boarding pass printing. This parking option serves domestic travellers only. Please bring a copy of your confirmation details with you on your day of travel. Please note you’ll receive a confirmation email from both Looking4Parking and Atlanta Park ‘N Fly. Luggage assistance, hand car wash, detailing, and Jiffy Lube services available. Please pull a ticket from the entry column when you enter Atlanta Park ‘N Fly.